As a part of SeaFest 2017, UL research team (Daniel Toal, Edin Omerdić and Romano Capocci) attended a two-day Marine Trade Show, the Digital Ocean Conference and Our Ocean Wealth Summit at NUI Galway. The Marine Trade Show showcased some of the highly innovative products and services emerging from more than 60 companies and organisations across all sectors of the marine economy. The Digital Ocean – Ireland’s Marine Engineering and Technology Conference featured a selection of international marine technology companies, innovative Irish Small Medium Enterprises (SMEs) and Ireland's technology and research centers, focusing on specific opportunities for technology innovations to drive the global blue economy. Our Ocean Wealth Summit forms a key part of the Government’s integrated plan for Ireland’s marine sector, Harnessing Our Ocean Wealth, and brings together world-renowned speakers, industry experts, business development agencies and the Irish business and marine research community for focused discussions on this year’s theme of ‘Rethinking Boundaries and Innovation for a Sustainable Marine Economy’. 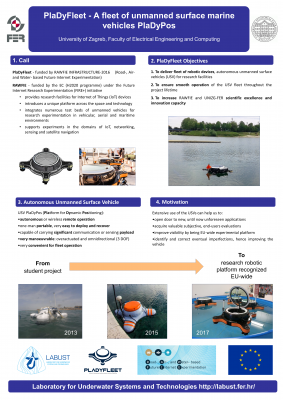 In addition to the discussion about ongoing research activities and possible collaboration, UL team invited participants to register their institutions to EXCELLABUST Marine Robotics Database (http://excellabust.mmrrc.ul.ie). UNIZG-FER LABUST members Marin Bek and Milan Marković will represent our spin-off project H2O Robotics on European Robotics League (ERL) Robots Major Tournament in Piombino, Italy next week. H2O Robotics is part of H2020 aPad project, which proposes the transformation of Autonomous Unmanned Marine Surface vehicle into commercially attractive, sustainable and innovative products that both address societal challenges and is highly competitive in global markets. ERL Emergency Robots Major Tournament 2017 will be held from 15th to 23rd September in Piombino, Italy. The tournament is a civilian, outdoor robotics competition, with a focus on realistic, multi-domain emergency response scenarios. It’s open to the public and anyone interested can attend as a spectator. Spectators do not need to register and the entrance is free. LABUST member Nadir Kapetanović participated at the IFAC 2017 World Congress. The congress was held in Toulouse, France on 9th -14th July 2017. Nadir presented the paper named "Real-time model predictive line following control for underactuated marine vehicles", which is the result of his expert exchange at CNR, Genova, Italy, as a part of EXCELLABUST project. Among other activities, he promoted LABUST and Breaking the Surface annual workshop, which is organized by LABUST for the 9th time this year, and will be held from 1st to 8th October 2017 in Biograd na Moru, Croatia. UNIZG-FER LABUST members Nadir Kapetanović and Đula Nađ participated in OCEANS '17 MTS/IEEE conference. The technical programme lasted for three days, from 20th to 22nd June 2017. There were close to 40 exhibitors showcasing their companies, as well as research laboratories and universities related to marine robotics research. Nadir Kapetanović presented early results of his Ph.D. thesis in a paper "Development of model predictive guidance for underactuated marine vehicles: From simulations to experiments", and Đula Nađ presented the final validation results of CADDY project in a paper named "CADDY Project, Year 3: The Final Validation Trials". They used this occasion to discuss marine robotics topics from their research fields with world-renowned experts from both academia and industry. They also promoted Breaking the Surface workshop organized by LABUST, which attracted much attention among conference attendees. Dr. Edin Omerdić from the University of Limerick attended the 14th International Conference on Control, Automation, Robotics and Vision - ICARCV 2016. The conference took place in Phuket, Thailand from 13th till 15th November 2016. Edin presented a paper "User Interface for Interaction with Heterogeneous Vehicles for Cyber-Physical Systems". ICARCV 2016 conference, organized by Nanyang Technological University and technically co-sponsored by IEEE Control Systems Society, was focused on both theory and applications, covering control, automation, robotics, vision and emerging technologies, including cyber-physical systems. The paper provides a brief overview of research activities about the development of user interfaces for interaction with heterogeneous vehicles in smart cyber-physical systems. Project Manager Ivana Mikolić from UNIZG FER held an invited talk "How to get and implement successful EU project" at Project Management Forum organized by Croatian chapter of Project Management Institute (PMI Hrvatska) on 10th November 2016. Through the lecture she presented LABUST research activities and projects in front of the business representatives. They discussed what are the main project management characteristics and challanges at the public institution in comperasment to bussines sector. Juan David Hernández from the University of Girona attended the IEEE/RSJ International Conference on Intelligent Robots and Systems (IROS 2016) in Daejeon (Korea) on October 9-14, 2016. The presented work was entitled “Planning Feasible and Safe Paths Online for Autonomous Underwater Vehicles in Unknown Environments”. It proposed an AUV framework for mapping unexplored environments while planning feasible paths. The presentation included simulation and in-water trials, which were conducted over natural and artificial marine environments. The proposed framework not only calculates paths that are more likely to be followed by an AUV but also takes into consideration the risk associated with such paths. This allows the vehicle to safely navigate through the unexplored environment while moving close to nearby obstacles. The conference in which this work was presented is one of the most important events for the robotics community in the world. Nikola Mišković presented a paper at the Conference on Underwater Communications and Networking (UCOMMS'16) that took place from 30 August to 1 September 2016 in Lerici, Italy. The conference series is focussed on working towards an adequate physics-based understanding of the propagation of communication signals underwater and the performance of necessary higher-level protocols with the objective of supporting the intelligent choice of standards, as a foundation for interoperability. LABUST members Nikola Mišković and Marin Stipanov presented LABUST activities and projects during the Student Autonomous Underwater Vehicles Challenge Europe (SAUC-E'16) that took place in NATO Centre for Maritime Research and Experimentation, La Spezia, Italy from 3rd to 8th July 2016. We organized a promotional booth and Nikola Mišković gave a talk "Humans and robots - buddies in the underwater". The most successful teams during the competition were awarded free registrations for "Breaking the Surface 2016"!